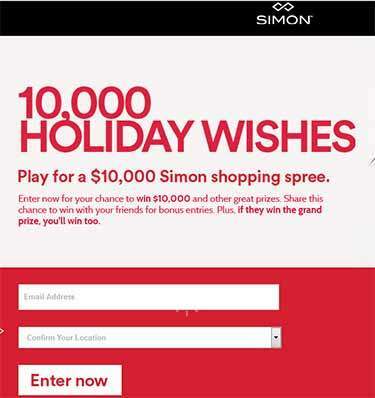 Simon.com/wishes – 10,000 Holiday Wishes Sweepstakes and Instant Win from Simon Property Group Real Estate Business. 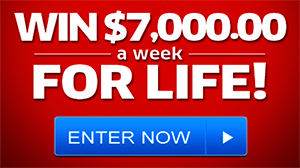 Enter now for your chance to win $10,000 and other great prizes. Share this chance to win with your friends for bonus entries. Plus, if they win the grand prize, you’ll win too. Simon is a global leader in retail real estate ownership, management and development, and an S&P100 company. This Holiday Simon Property Group is sponsoring this wonderful promotion where the lucky winner will get a $10,000 Cash Prize. Christmas time is renown for sharing and giving and Simon is no exception for the Holidays with this amazing sweepstakes. No purchase necessary to enter. Visit today, simon.com/wishes official website and follow the on-screen instructions to enter Simon’s 10,000 Holiday Wishes Sweepstakes and Instant Win for a chance to win a shopping sprees at Simon Malls worth up to $10,000 from Simon Property Group..
What a nice way it would be to start the new year with a $10,000 Shopping Spree prize. Good Luck and Happy Holidays! I would LOVE to have a new and have going places with out braking down. I want to be a Winner….